Photograph from the Curzon Collection: 'Presented with feelings of friendship and sincere admiration to Lord Curzon of Kedleston, Viceroy and Governor-General of India, by H.H. Rasulkhanji, Navab Junagadha. 1900', of the Central Jail at Junagadh, Gujarat, taken by the Solankee Studio, Rajkot, in c.1900. The design of the jail is a version of the panopticon system proposed for the creation of safe and humane prisons in 1791 by the English philosopher Jeremy Bentham. 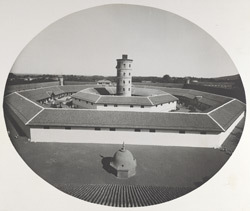 Cells are arranged in concentric rings around a surveillance tower at the centre from which prisoners could be observed. In late 19th-century India this was considered a modern form of construction and was used for new prisons in Gujarat and other states.